Treat yourself to a day of pampering at our full-service spa salon. At Callahan & Co. 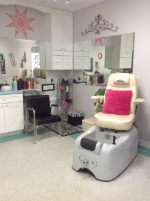 Salon & Spa, we offer men’s and women’s haircuts, manicures and pedicures, waxing treatments, and more. We’re a small town salon that believes in personalized service and getting to know each of our clients. Our stylists can give you a fresh, new look, from quick trims and specialty cuts to temporary perms and professional straightening. If you are debating trading in your lengthy locks for a blunt bob, or wondering whether a wave perm would work well with your hair type, we want you to turn to us for our expert opinion. Our stylists are experienced and trained to help you look your very best. Getting a mani/pedi is your chance to sit back, relax, and release some tension from your hands and feet. Our Spa Manicure experience includes replenishment with citrus fruit, essential oils, antioxidants, vitamins, and nourishing moisturizers. Our Spa Pedicure experience includes a raw earth ritual, skin exfoliation, hydrating treatment, and relaxing massage. Try one or try both! Either way, you’ll leave our salon feeling completely refreshed and looking polished. Getting rid of pesky, unwanted hair is a job no one looks forward to. With our long-lasting waxing treatments, you’ll be able to take a break from shaving and other at-home treatments. We offer waxing for your eyebrows, lips, chin, full face, underarms, lower legs, and full legs. Try one treatment, or try them all! Our waxing treatments will leave your skin silky smooth and radiant. In the spirit of being a small town business, we offer another great service right next door, self-storage units. 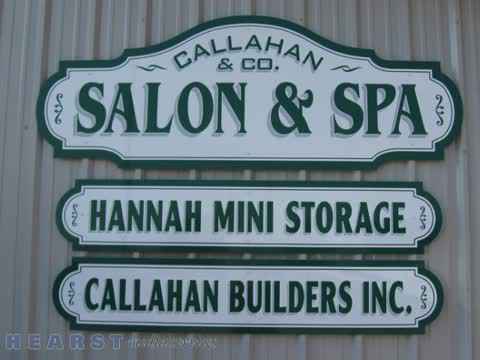 Hannah Mini Storages, Inc. is a storage unit building offering conventional and climate-controlled units. Stop by or give us a call to learn more.